Most everyone has seen the Fort Sill style grasshopper patch, and the "mosquito" patch from the T-6 guys in Korea. What other "War Bugs" (as the guys that like to buy lots of gas for an hour of flying call us) and associated patches were there? I saw a Disney designed patch for the Aeronca L birds before, but don't think I have a copy of it. Think the grasshopper on that one was looking through binoculars. I know it's a bit of a reach to include the 6's but the name fits. Can you come up with some others? 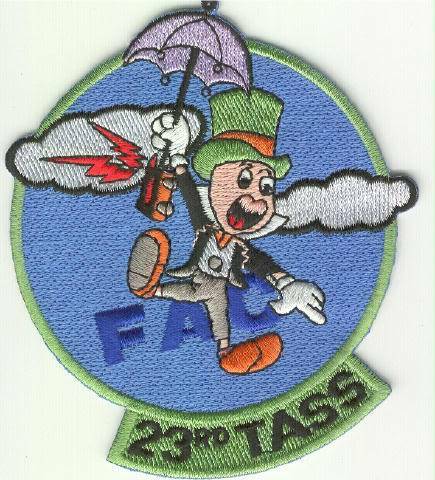 This is a patch from the unit that my O-2 was in in Thailand, 1970-72. Aeronica had one by Disney, he's wearing googles and holding a control wheel and is over the US star insignia and he was known as "Abel', Then there's the one with the grasshopper landing in front of a Mountain paek with snowcapped top, and his top hat flying off. The 72nd Liaison sqd has a grasshopper behind an 8 ball on triangle background.